We are so fortunate to work with many great window and door manufacturers who stand behind their products. Recently we replaced a full house of windows with the Milgard, Tuscany Series window. The customer noticed the glass on one of her new picture windows had more “flex” to it than her other picture window. I looked at it, and sure enough it did seem a little different than the other one. Everything else looked great so I set up a time for our Milgard representative to visit the job with me to investigate this situation. He inspected the window – said the installation was flawless and there were no visible defects so he went back to the factory to determine what glass was used. It turned out the picture window glass was too thin by 1/16” and he set up a time for Milgard to come out and replace the glass. 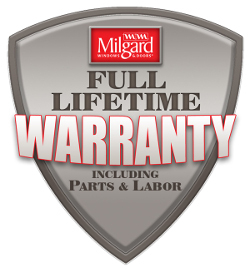 Milgard offers a full lifetime warranty for both parts and labor to the original homeowner – plus a transferable 10-year warranty if you sell your home. The Tuscany and the Essence Series windows even have a glass breakage warranty. This warranty is with the window regardless if you have our experienced Bridgetown team install them, a large commercial contractor, a custom home builder or even your Uncle Fred.